Ok, this review needs to come with a disclaimer. This particular pint, well, it was bought for St. Patrick's day. I'm not a drinker, so I thought this would make an fun substitution. Unfortunately I got busy with the surprise romp up to Vermont, and while there, I tried Mud Pie. I realllllly didn't like Mud Pie and ever since then I was afraid that this pint would taste the same. Sure mud pie is Irish coffee liqueur and this is Irish cream liqueur and I should have know the difference, but well, hey, I'm here now. So here is Dublin Mudslide, "fresh" from the deep freezer: It's Irish cream liqueur ice cream with Chocolate Chocolate Chip Cookies & a Coffee Fudge Swirl. Now remember I don't like coffee, but being that it's a just a swirl, it is questionable about how big a role coffee will play in this ice cream. Well it's held up surprisingly well for being in the basement freezer for **5** months. Scary, isn't it? There is that cavern of question-ability there on the right side, it does have some ice crystals, but overall, this flavor has held up really well. I start digging in and am instantly struck with a single word that sums this ice cream up perfectly. This ice cream would more aptly be described as Tiramisu, and that is a good thing. I went in expecting to totally dislike this flavor yet here I am very pleased with my find. Sure, there is that subtle coffee vibe, but hey,that's tiramisu for you. The coffee is also lingering there in the aftertaste, but I really can't complain. That's the great thing about being subtle, it's harder to get frustrated with it. Tiramisu is one of those great desserts that you treat yourself to like once a year, and here Ben & Jerry's has recreated something similar in a pint. The good news is that it doesn't end there. 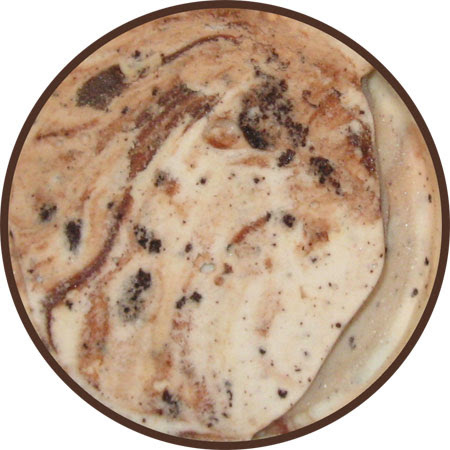 Inside our delightful pint are chocolate chocolate chip cookies and they are superb. I was having a grand old time taking a big cookie bite with ice cream on the side. I guess I'm just amazed that a five month old pint of ice cream tastes this good. You can't beat a good surprise and I am surprised right now. On Second Scoop: So I finally went back for my second scoop, though I will admit it was with lowered expectations. "Why?" you ask, well, because first I read the 2004 two dips review which wasn't too bad, but then I found gigi's 2007 review and I really started to wonder. Did there use to be a cheap alcoholic taste to this that maybe faded in the long wait in my freezer? or has there been changes since this use to be just a limited edition flavor? I dug in and honestly, I still like this flavor. Maybe it's not a perfect tiramisu flavor, but it's the closet thing I can think of. I also still love those ooey gooey chocolate chocolate chip cookies that are floating around, though I wouldn't say no to a few more of them. I appreciate the fact this ice cream is unique enough to be different, but not so crazy coffee different that most people will be turned off from it. I really don't eat ice cream unless it's Hagen Dasz (hurray for American ice cream trying to be german!) or B&Js Chunky Monkey. But this stuff looks like it would go well on a banana split! I just tried Dublin Mudslide last week and had to go back to the store to buy two more containers this week. OMG, is all I can say. I have found a new dessert nirvana!!! My new go to, to feel decadent!! Worth it and I am not a fan of Irish Cream, but it works in this for me!! Go to Ben & Jerry's website and click on "Resurrect a Flavor" and submit a request to bring our favorite ice cream flavor back!! Tell your friends! Tell your enemies! Let's get our beloved Dublin Mudslide back into production! I couldn't find a "resurrect a flavor" link, only the "flavor graveyard." Help! I don't care for Bonnaroo Buzz nearly as much, but it's sort of close. I've already had to do w/o Vermonty Python! Help! BEST FLAVOR EVER! I have been looking for this for years, this might be the worst news I've ever heard. BRING IT BACK!!!! 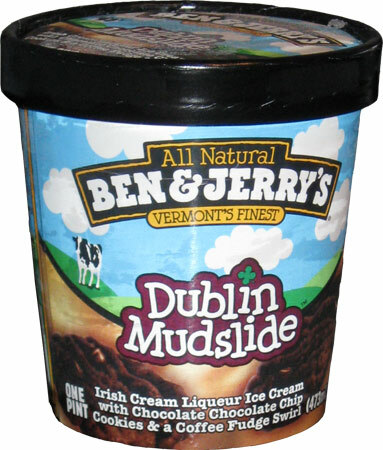 Please, please, PLEASE bring back Dublin Mudslide!! !